Blogs make great mobile websites. A typical blog has short timely posts that are mostly text. Blog posts downloads quickly even over the slowest mobile connection and can be an entertaining way to send the idle minutes spent waiting in line or riding public transit. If you have a blog you should really try to make it as usable as possible on mobile phones. You’ll be rewarded with more readers and, if you want, you can advertise on the mobile edition of your blog for a little extra revenue. No matter what blogging platform you are using there are ways to make your content mobile friendly and most of them, including all the ones listed below, require no programing and are very easy to set up. The two most important things in converting web content for mobile browsers are page size and thematic consistency. Most mass market phones can’t handle very large pages, if there’s more than 10kB of markup and 20 KB total with images, the page will fail to load or be very sluggish to navigate. Mobile blogs generally display only one post per page which helps keep size down. If you write long posts and use more than a three small images per post look for a mobile blogging platform that can split large pages and resize or strip images. For maximum traffic and usability your site should support thematic consistency, meaning that when a user types the URL; http://YourBlog.com/The_Meaning_Of_Life they will get your post revealing the meaning of life formatted for the device they are using – whether its a PC or a phone. Users shouldn’t have to enter a special url to get the mobile version. The software should be smart enough to detect the browser and deliver the right version. Thematic consistency done right benefits users and publishers because every external link goes to content that’s usable on the current device. Use a blogging platform that has mobile support built in. Use a plugin to create a mobile version of a self hosted WordPress blog. Use a service that creates a mobile site from your RSS feed. Use a transcoding service to reformat your blog (or any site) to be more mobile friendly. Using a blogging platform that has mobile support built in. This is the easiest and potentially the best approach as it requires little or no action on the blogger’s part. Unfortunately there are only two platforms I know of that have integrated mobile support, Windows Live Spaces and Vox, both of which are more social networks than “serious” blogging engines. Vox and Spaces do show the potential of this approach. Both produce highly usable mobile pages with images resized and long posts split up into multiple pages. Most of the PC blog features carry over to mobile including blogrolls, galleries and the ability to read and post comments. I wouldn’t switch to Vox or Live Spaces to get mobile support but if you are already using one of these platforms you’re all set. I just wish WordPress, Blogger and TypePad offered integrated mobile support. 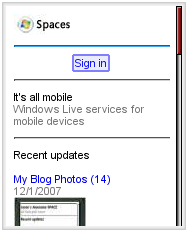 For an example of a Mobile Space visit It’s all Mobile (top image). For an example of a Vox blog, check out Arashi. Using WordPress Mobile Plugins. WordPress is the most popular (and I think the best) software for publishing self hosted blogs. It’s free, easy to install and supremely configurable thanks to its modular architecture which supports “Plugins”, small code modules which customize and add new features. Listed below are 4 WordPress Plugins that deliver mobile content to phone browsers. Installing any of these is as simple as copying the files to your site’s wp-content\plugins folder and enabling the plugin on Plugins tab of your WordPress Dashboard. The only potential headache with plugins is that they aren’t always updated to work with the latest WordPress releases. All these plugins offer thematic consistency but page size is not managed except by Mowser. Alex King’s WordPress Mobile Plugin: This is the granddaddy of all WordPress Mobile plugins. Like the the other plugins, it’s free and easy to install. There’s no image resizing or page splitting and the markup is generic html that doesn’t validate but displays without problems on most mobile browsers. Confirmed as compatible with WordPress 2.2.n, I don’t know about 2.3. See it in action at ZdNet’s The Mobile Gadgeteer. Andy Moore’s WordPress Mobile Plugin: This ambitious plugin has support for AdMob mobile ads, a hit counter and it even gives you the ability to post from your phone! The plugin delivers pages that validate and paginates comments (but not posts). There is no image resizing. MobHappy and m-trends are two A-List blogs that using this plugin. Works on WordPress 2.2.n but not 2.3.n, however there is a patch to make it compatible with 2.3. Russell Beattie at Mowser has also written a WordPress Plugin that works a little differently than the above 3 do. 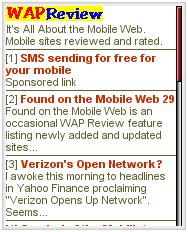 Russell’s redirects mobile browsers to a transcoded (by Mowser) copy of your blog. 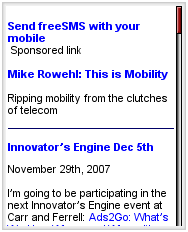 Used by tarek speaks mobile and Mike Rowehl’s This is Mobility. This plugin is pretty simple, it just does a redirect, and should be compatible with just about any WordPress version including the latest, 2.3.1. It’s hard to recommend one of these plugins over another. Andy Moore’s is the most feature rich and you should probably look at it first. Notes: Image Resizing: Winksite, xFruits and Wirenode strip all images from posts. Winksite and Wirenode also remove links. Ads: FeedM8 always shows ads on your pages but will share the revenue with you. Winksite, MoFuse and Mowser show no ads on your pages by default (Mowser has ads – but not on publisher pages) but you can set them up to display ads. The main disadvantage of the RSS to mobile services is that they are external to your domain so they can’t by themselves provide thematic consistency. They are also limited to the content in your feed, there is no way to get any of the other features of your blog like your About page or archives. Still, the better ones produce excellent mobile sites. I recommend Mowser and FeedM8 (third image) as they are the only RSS to mobile services that allow mobile users view and post comments, and also the only ones that split split long pages and resize images. Transcoders have the advantage of converting all the content of any site to mobile format. They also tend to deliver rather poor mobile usability. Still for sites with a simple design, which includes most blogs, transcoders can do a pretty decent job. The bottom image shows Mike Rowehl’s blog in the Mowser transcoder. See Mowser’s Publisher FAQ for more information including neat examples of how to redirect mobile browsers using Apache’s Mod Rewrite or PHP. There’s really no reason not to mobilize your blog today, its easy and you will have increased your potential audience by 2.7 billion users! Please leave a comment if you know of any other good ways to create a mobile site from a blog without coding. I’m particularly interested in blog platforms with built in mobile support and solutions that provide thematic consistency and manage page and image size. 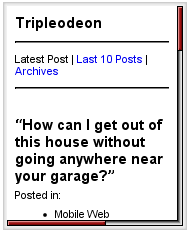 This entry was posted in Blogging by Dennis Bournique. Bookmark the permalink. Then stop SHOUTING and just do it with the instructions provided above. Login to http://www.mobstac.com and in just 3 simple steps, your blog will become the mobile friendly one. You can also use your own ad content for it. Have you heard about MobStac – A platform where you can access your blog through mobile. Good article. Im having poll blog.. It has beautiful flash with image polls. Do you have any idea about haw to make flash content viewable in mobile? I still confuse to find way for blogspot on how to become mobile friendly and can show ads in blog. And not change the link of blog too. on Mobile(cell phone) Industry and happenings. Please continue the good work. Thank you. We’ve released a WordPress Mobile Plugin based on Andy Moore’s plugin which will extract images from post and pages and reszize them to a size which will be diplayed on mobile devices. I know good plugin for WordPress. You can create mobile version by Blog2Mobi. Great tutorial, still playing with the format but so far so good! I use the Mowser approach too, it works nicely for me, and inserts my AdMob (or Google) adverts automatically. I just use a dns entry to redirect to Mowser all traffic to m.feetup.org and I’ve added some appropriate html headers to help Mowser do the right thing, as described on the Mowser Publisher FAQ. Alex King’s plugins are licensed under GPL according to this page: http://alexking.org/projects/wordpress/ , so you should be OK redistributing it under that license. You are right, MoFuse doesn’t show ads by default. I’ve edited the post to reflect that. Check out our website from your mobile browser http://www.berryreview.com. I have set it up with a overly hacked version of Alex Kings mobile plugin and I am wordering how it works on nonBlackBerry devices. I put in quite a few corrections and hacks to make the mobile version of the site support wordpress search, Pagenation, math comment spam protection, Login/out capabilities, and the all important link to the RSS feed. Personally I am wondering why they do not have a link to your RSS feed on any of these plugins? Dennis, do you think the license of Alex Kings WordPress mobile edition would allow me to release a version with my hacks? I have shared it with other friends who are using it to run their mobile site but I am not sure if I am allowed to repackage it. I tried contacting Alex King but never got a response back. Thanks for including MoFuse in this writeup. I just wanted to clarify something. MoFuse doesn’t show ads on your mobile site by default, our users can opt-in to our revenue sharing program. If they want to keep 100% of their revenue and be able to do some other cool things they can enroll in MoFuse Professional which is only $6/month. Cellfish Media recently launched a blog mobilizer that can convert RSS to mobile as well as a button which formats media files (audio, video, pictures) to mobile. The button uses Cellfish’s SMS platform and triggers a SMS with a deep link to the media. It’s much easier than having to type the URL in the browser. I prefer RSS to mobile solution. Thanks for the update, I’ve confirmed that Wirenode does support WML and edited the post to reflect that. I did notice that most of my, admittedly long, posts failed to load with “Compiled WAP binary is too large” on the WML phone. WML browsers have very low limits on page size. For Openwave, which I’m using, it’s 3000 bytes, some others have limits as low as 1397 bytes. I also got a compile error on a page with a $ character when using Wirenode. For WML $ must be escaped as $$. Hi, thank you for good review. One little correction: Wirenode supports the WML, but you can’t try it by change USER-AGENT only.